On Thursday, June 14, Snapchat officially launched its new platform for third-party developers. Known as Snap Kit, developers can now integrate Snapchat features into their own apps — while also keeping user data safe. Snap Kit is separated into four different integration options, which are each their own separate kits. With Creative Kit, users can integrate stickers, links, and filters from other apps into the Snapchat camera. For example with Postmates, one of Snapchat’s launch partners, you will be able to snap friends with a Postmates sticker that shows the estimated time your food is supposed to arrive. If you and your friends can’t decide on where to eat, you can also snap them the best options nearby. Users can also send songs via Snapchat using music apps SoundHound and Pandora. If you’re on SoundHound, all you’ll need to do when you discover a song you like is tap “Snap this song,” the Snapchat camera will then pre-populate the camera with artist and song stickers along with a link to the song. 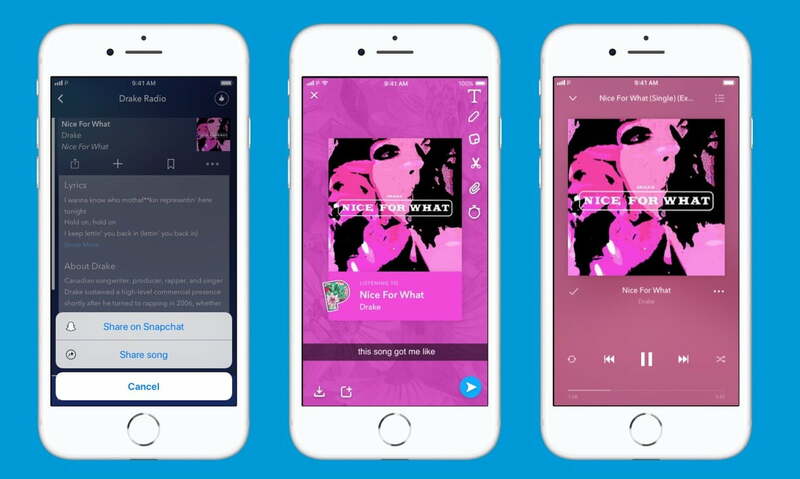 As for Pandora, users can create song cards to Snap to others or share to their Story. Whoever you send it to can then swipe up to listen to the song on Pandora, even if both apps aren’t connected. There’s also Bitmoji Kit that gives users access to their Bitmojis across other apps. Even though the personalized cartoon avatars are already available as a keyboard extension, you’re unable to use it within some apps — such as Tinder. With the integration, those swiping on Tinder will be able to send their Bitmoji through direct messages by connecting both accounts. Another option is Story Kit that allows third-party apps to embed Snapchat Stories into their own websites. Apps will then be able to share any public Stories that relate to their audience based on time, captions, locations, and more. With Login kit, you can use your Snapchat account as a way to login into apps which also brings along your Bitmoji. But when it comes to logging into different apps, Snapchat made it clear that user data is safe. You’re only asked for your Snapchat Display Name and Bitmoji avatar (which is optional) when signing into other apps rather than more personal information like your email or phone number. The company also doesn’t share demographic information or friends list with third parties. For further security, Snapchat also stays on top of inactivity. If you haven’t used an app that you’re signed into via Snapchat for over 90 days, Snap Kit will automatically disconnect you. For now, Snapchat is launching the new platform with only a small group of apps. But any future third party Snap Kit integration will have to go through a human review process. All developers who submit their apps will have to agree to the privacy standards built into the Snap Kit program in order to gain approval.